An in-depth discussion of the treatment and prevention of infectious disease. A closer look at drug discoveries and developments that affect clinical practice. An in-depth look on the latest issues affecting the infectious disease physician. 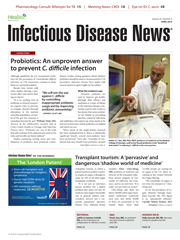 Experts discuss the latest news in infectious disease. Infectious disease issues that affect people worldwide. An in-depth look into infectious diseases that affect both humans and animals. Answers to common questions about infectious diseases. An in-depth look on the latest issues affecting the hepatitis C specialist. A look at practice tools for a specific population. Meeting highlights and analysis from the Conference on Retroviruses and Opportunistic Infections. A look at common issues in younger patients. Experts detail clinical scenarios faced during diagnosis and treatment. An in-depth look at a unique patient subset. Experts discuss the latest news in hepatitis C.
News you can use for your patients and practice. Pharmacological analysis for the HCV specialist. HCV Next asks five questions of prominent experts in HCV. Dr. Brien’s Medical History Moment blog explores the varied origins of infectious disease. James H. Brien, DO, is from the Department of Infectious Diseases at McLane Children's Hospital, Baylor Scott & White Health, Texas A & M College of Medicine in Temple, Texas. He is also a member of the Infectious Diseases in Children Editorial Board and a long-time author of the print column What’s Your Diagnosis? seen in the same publication. Brien can be reached at: jhbrien@aol.com. Paul A. Volberding, MD, is the Chief Medical Editor of Infectious Disease News and a professor in the department of medicine and director of the Center for AIDS Research at the University of California, San Francisco. Volberding is the past president of the International AIDS Conference.